This step is used to help identify and report potential harmonic problems. 20% of industrial plants cannot operate capacitors without some careful attention to the harmonics. This means that 80% of industrial plants will not have problems, but it is wise to study any possibility for harmonic effects in the initial evaluation. The measuring instrument used to make the preliminary measurements in step#2 should have the capability to report harmonics as well. Main bus voltage distortion; Measure the THD including all harmonics and, also, individual harmonic magnitudes in percent, of fundamental. Harmonic content of load currents, particularly those in suspected harmonic-producing loads such as adjustable-speed motor drives. The THD and rms values are needed as well as magnitudes of individual harmonics. Representative harmonic current in existing capacitor banks, at least the THD and rms values. The distortion of the total plant current is greater than 10%. As you take the power intervals, take periodic harmonic samples. If the load varies considerably, such as rolling mills, veneer lathes, etc., take several measurements to try to capture the worst case. If practical, measure the distortion of currents in existing capacitor banks. Existing capacitors are the best locations to find harmonic currents that might indicate that there is a harmonics problem. Unfortunately, capacitor leads are not always easily accessible. However, it is strongly recommended that you open one or two cabinets and measure the current. If you do not have a meter capable of showing the individual harmonic, measure the rms current with a suitable true rms ammeter. If the rms current measured is much higher than the expected rated current, there is likely to be a harmonics problem. Lack of high current in capacitors does not indicate that there will be no problems after the addition of capacitors. it only indicates that there are no harmonics now. The instruments for monitoring harmonics range from permanently installed 3-phase monitors to hand-held single-phase devices. 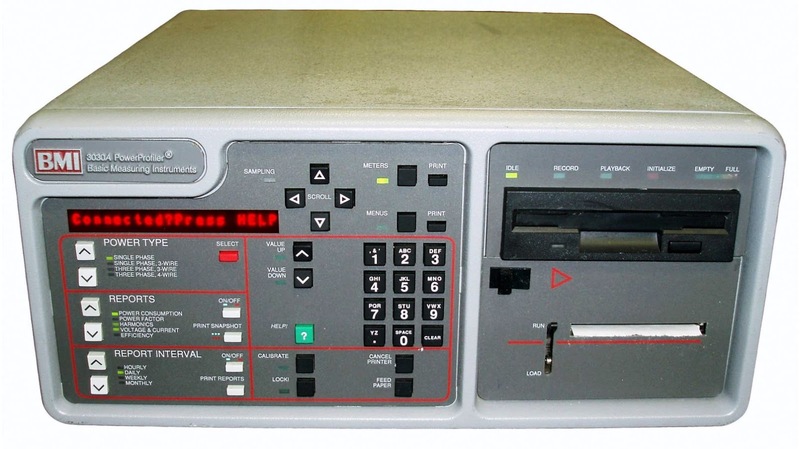 Most of the modern ones are capable of transmitting data to a computer for further analysis. While there are numerous instruments available for measuring harmonics, proper harmonic measurements and the proper interpretation of the results will generally require someone with special training in this field. This step is used to include the cost of studies and harmonic mitigation- if it is required - in the cost of the capacitor costs worksheet. In step#3, we ignore including costs of the harmonic study. Then, if there are significant harmonic sources or existing distortion, come back to the capacitor costs worksheet, add in the estimated study cost in step j & cell L23, and re-compute the economics in the Economic Evaluation Worksheet. Harmonic studies range from $3000 to $7000 for smaller industrial plants. Studies for large plants might typically be $15000 and up. Case#1: If the capacitors installation is still economical with these considerations, you may proceed with reasonable confidence that an economical and effective capacitors installation can be achieved and you can proceed with the design phase. Option#1: Stop the process if you feel certain that harmonic mitigation will be needed and not economically justifiable. Option#2: Proceed uneconomically into the design phase with the hope that the harmonic problems will not severely impact the installation, which happens frequently, and with the understanding that it may not be possible to find a capacitor scheme that is economical according to your criteria. Using the same data for example#1 in article " Power Factor Correction Capacitors Sizing Calculations – Part Seven" with taking into consideration the harmonics study cost of 10,000 USD. 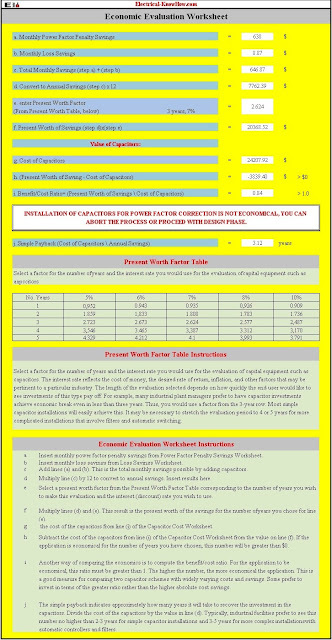 The worksheets indicate that a relatively simple fixed capacitor installation that costs approximately $30 per kvar is uneconomical based on a three year evaluation period and interest rate 7%. So, we can stop the process or proceed uneconomically to the design phase. The simple payback period is predicted to be about 3.12 years. Step#1.A: Review the one line diagram. Step#1.B: Take into consideration the loads that produce harmonics. Step#1.C: collect sufficient data Inventory by using measuring instruments. 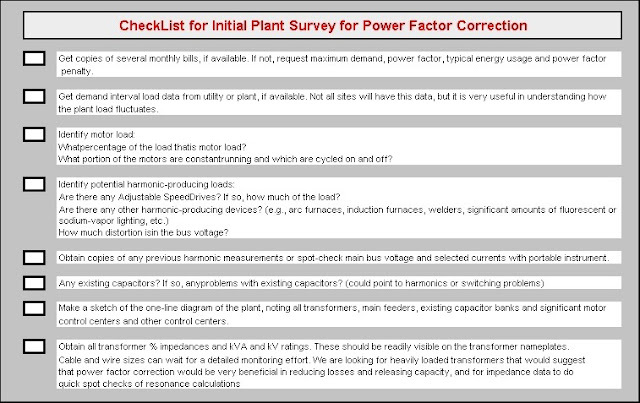 Review the one line diagram of the facility to determine the most appropriate form of power factor correction. The one-line diagram must show the main structure of the electrical system from the utility interconnection up to at least the main motor control centers and larger sub panels. You must note the Major types of loads, step-down transformers, and approximate locations for existing capacitor banks. Figure-4 shows an example of a simple one-line diagram. The main buses are indicated by the heavy bars and are labeled with the rated bus voltage. All significant transformers and loads (particularly nonlinear loads) should be indicated. 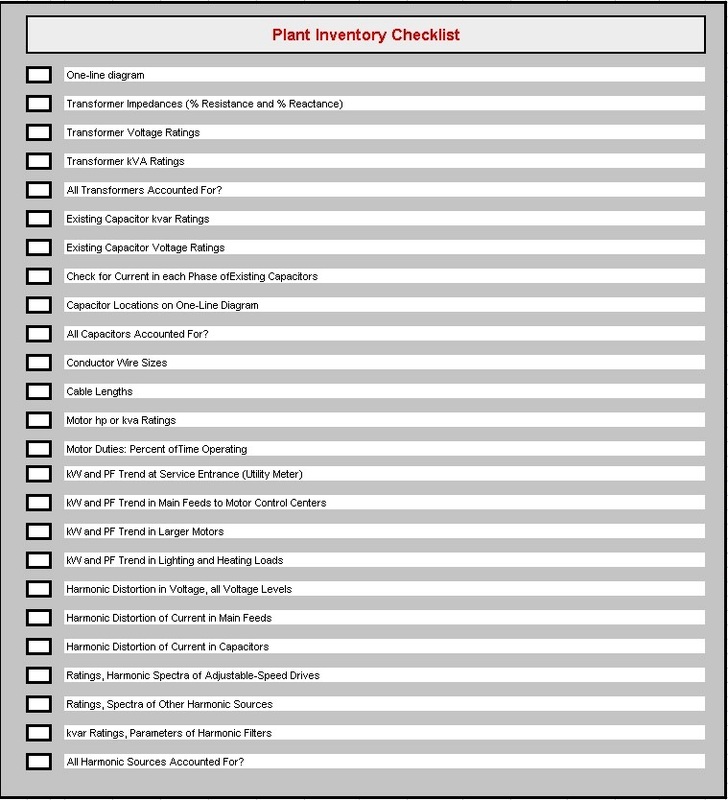 Complete the one-line diagram as you proceed with the detailed load inventory. 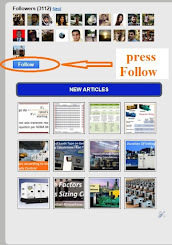 Supply the diagram to contractors and engineers you may choose to assist with the application. This will enhance communications considerably. If these loads exist in significant quantities in comparison to the size of the electrical system, a detailed harmonics study should be performed. 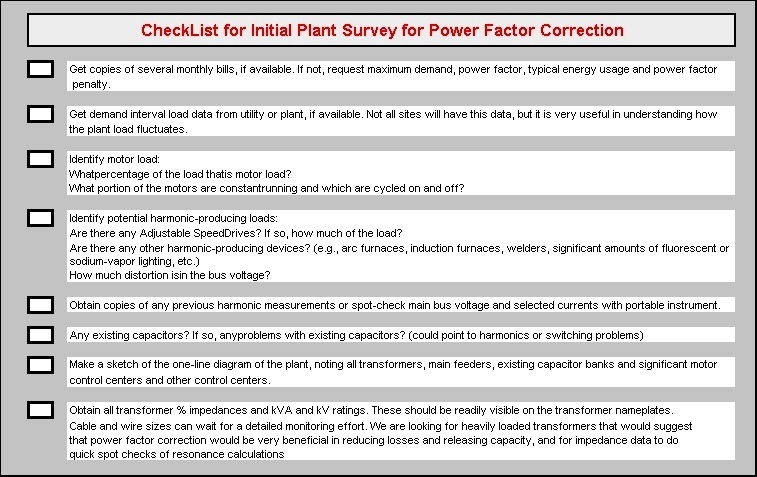 This is why it is a good idea to obtain a meter capable of showing harmonic distortion for the initial plant survey. A quick scan of the bus voltages and a few load or capacitor currents will provide a good idea of the existence of harmonic-producing loads. In this case, more engineering studies must be made to ensure successful application of power factor correction capacitors. 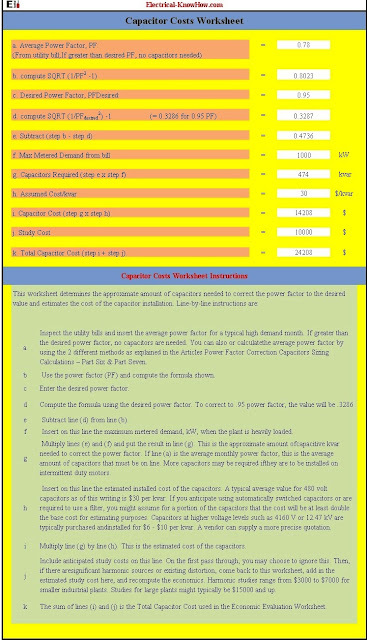 Studies typically cost several thousand dollars and additional costs may be incurred for filters or other specialized equipment necessary for proper operation of power factor correction capacitors. An existing capacitor bank that cannot be used because it either blows fuses or interferes with some process is almost a certain indication of harmonic problems. It could also be an indication that the capacitor and/or the associated load is switched often and might require some special considerations. Motors or transformers making unusual high-pitched sounds and lightly-loaded transformers running much hotter than other similarly-loaded transformers are signs for harmonic problems. Collect sufficient data Inventory by using measuring instruments to understand how the system behaves so that optimal capacitor configurations may be determined. Sufficient data should be collected to enable a detailed computer analysis. 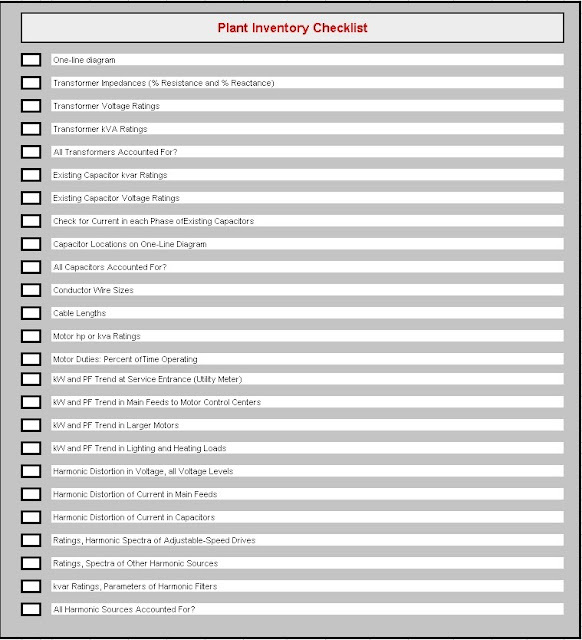 The below checklists in figure-5 contains all the specific data that you need to collect. To download your copy of The Initial And Detailed Plant Survey Checklists, please click on the link. Standard utility meters typically accumulate only kWh and kvarh over a month with a "drag hand" function that records the maximum demand interval. kW, kvar, PF by demand interval. Voltage and Current harmonics; snapshots and trends. Many utilities have adopted electronic meters which can provide you with this data for the whole plant. Some meters not only record the kW and kvar but can also differentiate between leading and lagging vars, reporting each for the interval. 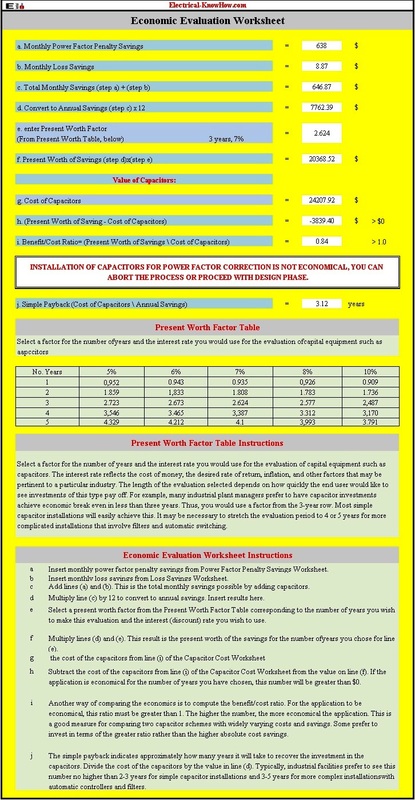 This is very useful for determining the amount of capacitance needed and for verifying the effectiveness of capacitors after installation. The utility metering typically collects only average data for the whole plant. While these measurements some general idea of how much total capacitance is needed, it provides little help in determining where to put it. For that, you will need to profile the loads on each major feeder and branch circuit for at least several demand intervals during typical loads. 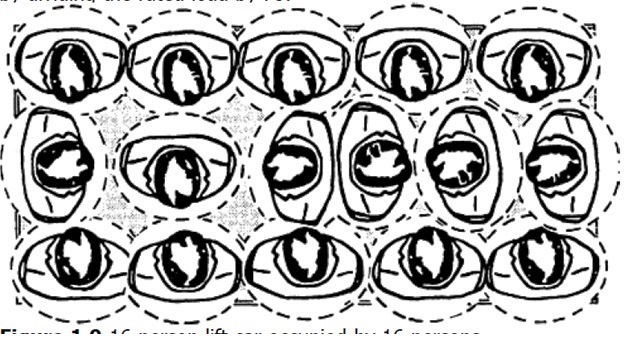 Figure-7 shows a modified version of the one-line diagram of Fig.4 with the minimum number of metering points required for a detailed plant survey. Meter at least each of the main feeds to the motor control centers (MCC) as well as other major sections of the plant, such as the office load. You may extend the metering farther out into the plant, to obtain the level of detail desired, as your time and budget allow. It is usually sufficient for the placement of power factor correction capacitors to meter just the major feeds within the plant. 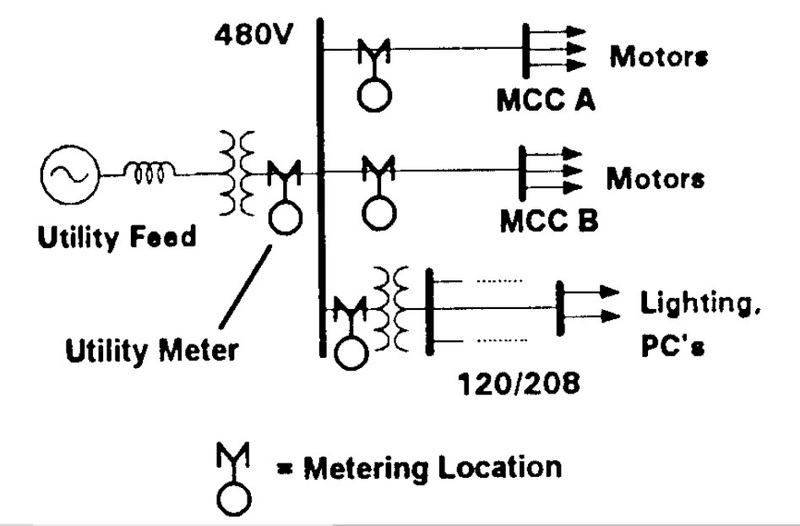 Fig.7: Metering locations for minimum power profiling for power factor correction. It would be ideal to collect all this data simultaneously. While there are some permanently-installed instrumentation systems with this capability, it is available only in a few industrial facilities. Therefore, you are usually constrained to using portable instruments that are moved from circuit-to-circuit. You may connect the metering at any convenient place along a feed. This is usually at the panel termination on either end. 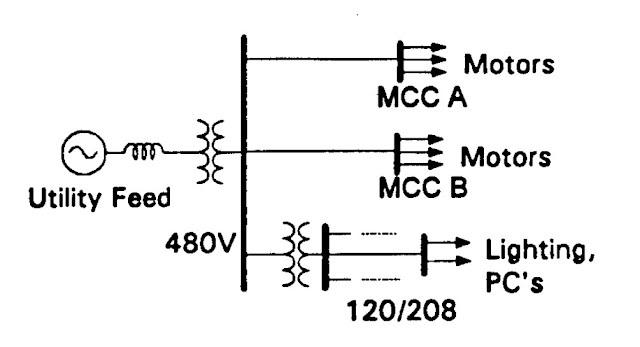 A power profiler must be connected to the three-phase bus voltages and three-phase line currents. This requires access to terminal lugs for voltage and an unobstructed access to the cables to install the current transformers. Permanently-mounted monitoring devices may be used, but it is generally sufficient to use portable meters with clip-on probes. On smaller cables, the clip-on probes are usually sufficient. For large cables, you must rely on existing CT's or be satisfied with clipping a probe on one cable in a parallel bundle and assuming the others are the same. The sequence of taking the measurements is generally of secondary importance unless there are particular load behaviors you are trying to capture. The most important thing is that you set up a system for keeping track of what measurements were made, when they were made and what was going on in the plant at the time. Keep a detailed log book. Use features of the profiling instrument for labeling any output. Leave the instruments in place for several demand intervals whatever it takes to properly characterize a load. For some loads, this may be as short as one hour or one duty cycle. For others, it may be necessary to monitor kW and kvar demand for several days to obtain definitions of the reactive power demand so that power factor correction can be properly defined. Generally, most individual loads are sufficiently consistent that the measurements need only be made through a few typical duty cycles. The main feeds should be monitored for at least a full typical working day. If practical, a full cycle of normal days and idle days (a week, 10 days, or whatever) should be monitored. This could be important later for determining whether or not to switch capacitors. The data collected are time interval data expressed as either kW and power factor or kW and kvar demand for that interval, depending on the capabilities of the instrument. The monitoring should be sufficient to determine at least the load going into each significant motor control center or subpanel. It is generally not necessary to monitor each individual motor load. The exception might be for a case where a few large motors comprised the bulk of a load at a particular motor control center. Monitor only the main feeds. Measure, at least, snapshots of the rms currents in the main cables to get an idea of how the load inside the plant divides. Assume the overall plant load shape for all loads. In lieu of demand interval data, several snapshots at different times will suffice. Obviously, the more data collected, the more likely it is that the capacitors will be added to portions of the plant where they will do the most good. The greatest benefits will be achieved on lines that have high current with respect to ampacity, poor power factor, and long cable runs. Therefore, make special note of loads and cables with these characteristics.